If you are planning on assembling your new robot, you will eventually want to learn about controlling variety of motors like DC motors, Stepper motors & servos. One of the easiest and inexpensive way to do that is to interface L293D Motor Driver Shield with Arduino. It’s a full-featured motor shield – perfect for many robot and CNC projects. 2 stepper motors (unipolar or bipolar) with single coil, double coil, interleaved or micro-stepping. 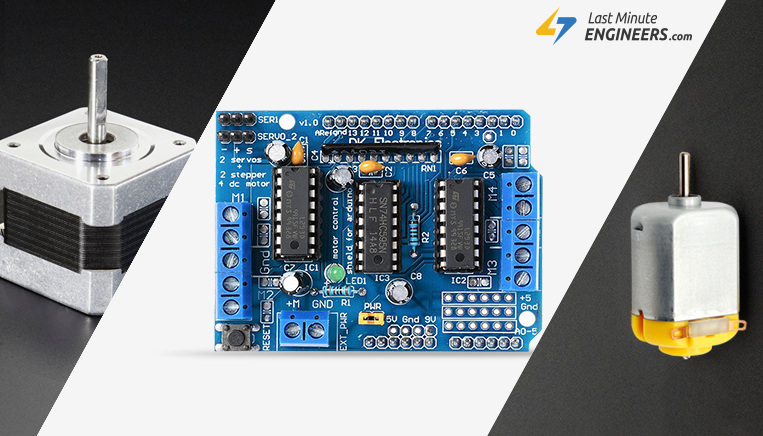 The L293D is a dual-channel H-Bridge motor driver capable of driving a pair of DC motors or single stepper motor. As the shield comes with two L293D motor driver chipsets, that means it can individually drive up to four DC motors making it ideal for building four-wheel robot platforms. The shield offers total 4 H-Bridges and each H-bridge can deliver up to 0.6A to the motor. 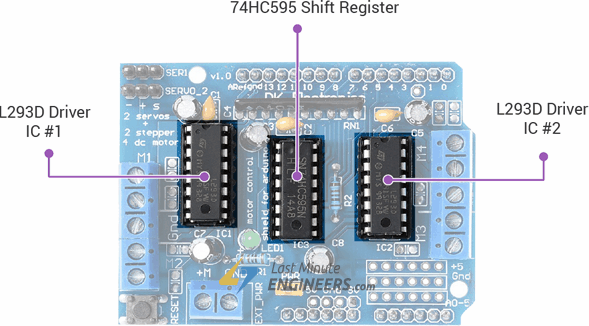 The shield also comes with a 74HC595 shift register that extends 4 digital pins of the Arduino to the 8 direction control pins of two L293D chips. There exists three scenarios when it comes to supplying power for the motors through shield. If you would like to have a single DC power supply for both Arduino and motors, simply plug it into the DC jack on the Arduino or the 2-pin EXT_PWR block on the shield. Place the power jumper on the motor shield. You can employ this method only when motor supply voltage is less than 12V. If you would like to have the Arduino powered off of USB and the motors powered off of a DC power supply, plug in the USB cable. Then connect the motor supply to the EXT_PWR block on the shield. Do not place the jumper on the shield. If you would like to have 2 separate DC power supplies for the Arduino and motors. Plug in the supply for the Arduino into the DC jack, and connect the motor supply to the EXT_PWR block. Make sure the jumper is removed from the motor shield. DO NOT supply power to the EXT_PWR input when jumper is in place. It may damage the motor shield and also your Arduino! The shield comes with a pulldown resistor array to keep motors switched off during power-up. The on-board LED indicates the motor power supply is Okay. If it is not lit, the motors will not run. The RESET is nothing but Arduino’s reset button. It just brought up top for convenience. The output channels of both the L293D chips are broken out to the edge of the shield with two 5-pin screw terminals viz. M1, M2, M3 & M4. You can connect four DC motors having voltages between 4.5 to 25V to these terminals. Each channel on the module can deliver up to 600mA to the DC motor. However, the amount of current supplied to the motor depends on system’s power supply. You can also connect two stepper motors to output terminals. One stepper motor to motor port M1-M2 and other to M3-M4. The GND terminal is also provided if you happen to have a unipolar stepper motor. You can connect the center taps of both stepper motors to this terminal. The shield brings out the 16bit PWM output lines to two 3-pin headers to which you can connect two servo motors. Digital pins #2, #13 and analog pins A0-A5 are not used by the shield. Analog pins are broken out in the bottom right corner where pin 2 has a small breakout. If you want to use these pins, you can connect some headers to it. In order to communicate with the shield, we need to install AFMotor.h library so that we can issue simple commands to control DC, stepper & servo motors. Filter your search by typing ‘motor shield’. There should be a couple entries. Look for Adafruit Motor Shield library(V1 Firmware) by Adafruit. Click on that entry, and then select Install. Now that we know everything about the shield, we can begin hooking it up to our Arduino! Start by plugging the shield on the top of the Arduino. Next, connect power supply to the motors. Although you can connect DC motors having voltages between 4.5 to 25V to the shield, in our experiment we are using DC Motors that are rated for 9V. So, we will connect external 9V power supply to the EXT_PWR terminal. Now, connect the motor to either M1, M2, M3 or M4 motor terminals. In our experiment we are connecting it to M4. 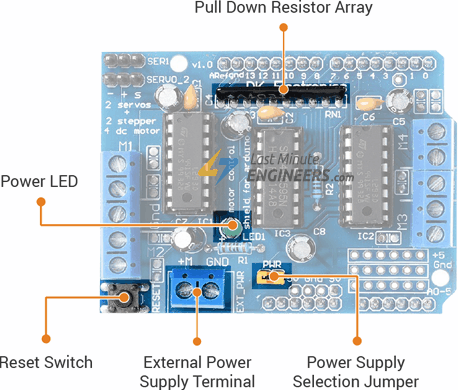 The following sketch will give you complete understanding on how to control speed and spinning direction of a DC motor with L293D motor driver shield and can serve as the basis for more practical experiments and projects. The sketch starts by including the AFMotor.h library. The second line AF_DCMotor motor(motorPort#); creates an object of library. Here you need to declare the motor port number to which motor is connected. For port M1 write 1, for M2 write 2 and so on. If you want to connect multiple motors to the shield, create separate object for each motor. For example, following code snippet creates two AFmotor objects. In setup and loop section of the code we simply call below two functions to control the speed and spinning direction of a motor. setSpeed(speed) function sets the speed of the motor. The speed ranges from 0 to 255 with 0 being off and 255 as full throttle. You can set the speed whenever you want in program. RELEASE – Stop the motor. This removes power from the motor and is equivalent to setSpeed(0). The motor shield does not implement dynamic breaking, so the motor may take some time to spin down. 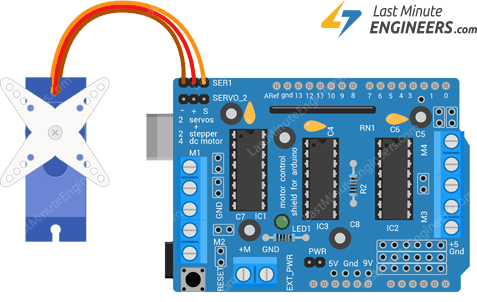 Let’s connect stepper motor to the L293D shield. Start by plugging the shield on the top of the Arduino. If you are using 28BYJ-48 unipolar stepper, those motors are rated at 5V and offer 48 steps per revolution. So, connect external 5V power supply to the EXT_PWR terminal. Remember to remove the PWR jumper. Now, connect the motor to either M1-M2(port#1) or M3-M4(port#2) stepper motor terminals. In our experiment we are connecting it to M3-M4. If you are using NEMA 17 bipolar stepper, those motors are rated at 12V and offer 200 steps per revolution. So, connect external 12V power supply to the EXT_PWR terminal. The following sketch will give you complete understanding on how to control a unipolar or bipolar stepper motor with L293D shield and is same for both the motors except stepsPerRevolution parameter. Change this parameter as per your motor’s specification before trying the sketch out. For example, for NEMA 17 set it to 200 and for 28BYJ-48 set it to 48. The second line AF_Stepper motor(48, 2); creates an object of library. Here you need to pass steps-per-revolution of motor and port number to which motor is connected, as parameters. setSpeed(rpm) function sets the speed of the motor, where rpm is how many revolutions per minute you want the stepper to turn. SINGLE – One coil is energized at a time. DOUBLE – Two coils are energized at a time for more torque. INTERLEAVE – Alternate between single and double to create a half-step in between. This can result in smoother operation, but because of the extra half-step, the speed is reduced by half too. MICROSTEP – Adjacent coils are ramped up and down to create a number of ‘micro-steps’ between each full step. This results in finer resolution and smoother rotation, but with a loss in torque. Driving the servos with L293D shield is as easy as pie. The motor shield actually breaks out Arduino’s 16bit PWM output pins #9 & #10 to the edge of the shield with two 3-pin headers. Power for the Servos comes from the Arduino’s on-board 5V regulator, so you don’t have to connect anything to the EXT_PWR terminal. As we are using the onboard PWM pins, the sketch uses IDE’s built in Servo library.